Back in early Spring I took a train trip out to Chestnut Hill for the day, just for a change of scenery. Chestnut Hill is famous for its quaint, privately-owned stores, farmers market, and antique shops. While strolling down Germantown Avenue after eating some lunch, I spotted these 45 RPM records in front of an antique shop and stopped to take a look because I hadn't seen vinyl records up close in AGES. What initially caught my eye was the tattered record cover of WHAM, picturing George Micheal, because last January I published a post about his passing on Christmas day so it was kind of bittersweet seeing his face again. No, I didn't purchase the record because I don't own a record player. Yes, I know I should have bought it anyway because the record would probably be worth a lot ($$$) in a several years. But hey, I wasn't even thinking about that at that moment, I was thinking about the late, great George Micheal. Seeing these 45's also brought me back to a time when vinyl was the only way you could purchase and listen to recordings (other than on a radio) in your own home. There were no tapes back then (8-track or cassette), let alone CD players or iPods. 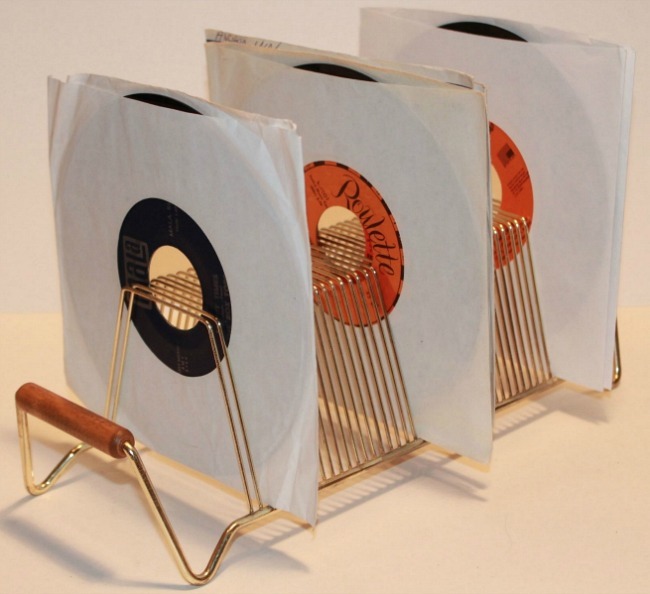 I used to store my 45's in something similar to the metal file above. 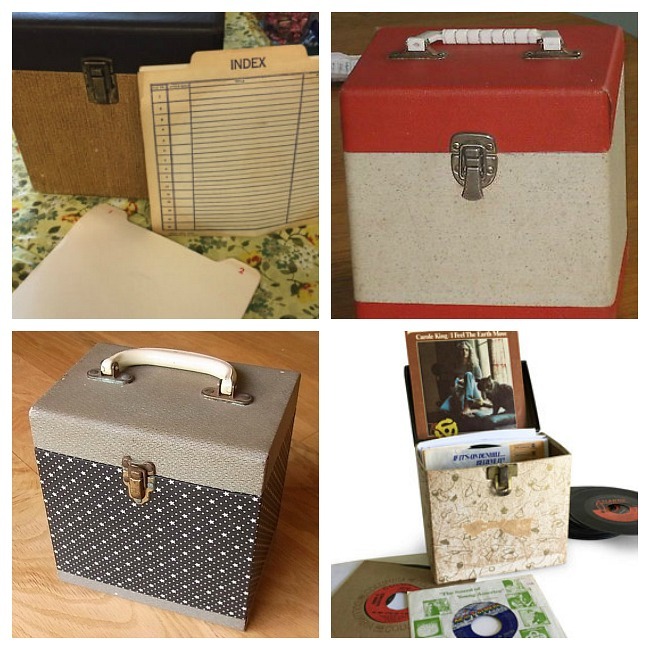 Later, I got one of these snazzy-looking filing boxes in which I stored my records either numerically or by alphabetizing them. This record player was similar to my first, which only played 45 RPM's. Isn't it hilarious? It's so bulky and boxy-looking. It looks almost robotic. 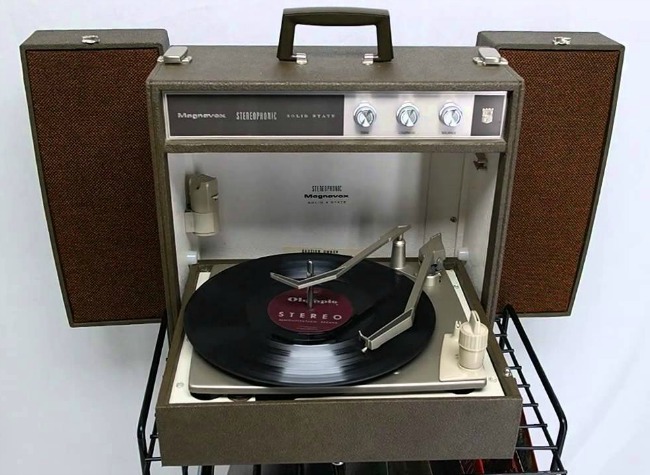 I eventually graduated to a stereophonic solid state record player that looked almost identical to the one above (a Magnavox), which played both 45's and LP's. Back then, this was SO high-tech! 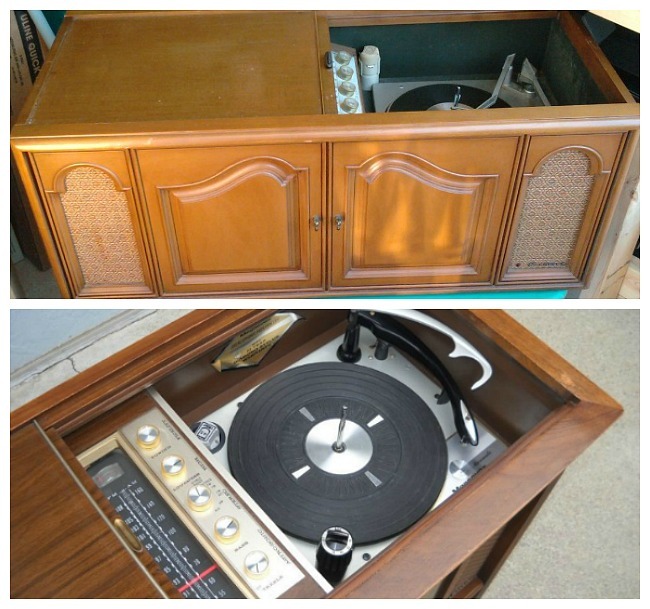 In the late 60's my family had a record player console stereo hi fi, just like this one. It was in our living room. I remember hearing my parent's LP recordings of Nat King Cole, Frank Sinatra, Patsy Cline and Bobby Darin, to name just a few. 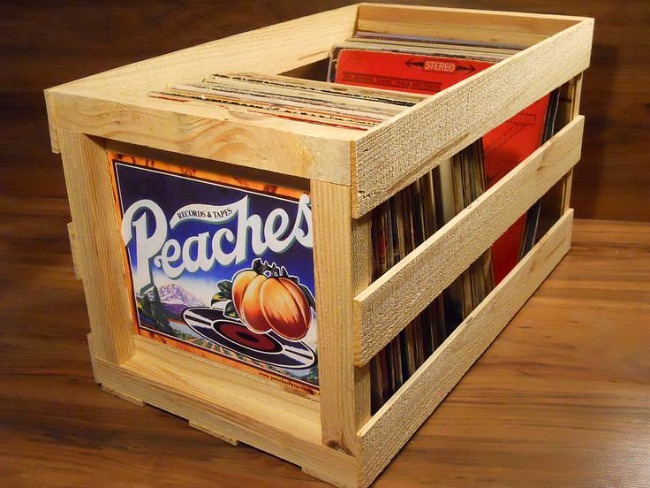 No joke, I used to keep all my LP's in a Peaches crate, just like this. Anyhow...seeing vinyl again made me recall what a joy it was to collect and play records. Yesterday, I went over to You Tube and found one of my favorite songs from the group Toto - Africa. Wishing you a weekend filled with fantastic music, everyone! I loved my LPs but it was so long ago I can't remember what they were. Doesn't the mind forget quickly? I do remember playing what must have been my favourites and recording them on an antiquated recorder so I could listen in another room. Storage was a problem because my mother hated what she called litter.... LITTER! How she dared use such language was beyond me. You can tell she wasn't one for music! I have just been going through my CDs, playing all of them in case there are any I no longer want. I removed one so I still have around 50 to keep me going. Great memories, Ron! I remember my first record player. It looked similar to yours, but was light blue and probably made for children. I remember having two Xmas storybooks that you played a record with to read along. The narrator would say, "Turn the page . . ." I LOVED it. When I was a teen, my parents bought me a stereo and I graduated to LP's like Shaun Cassidy and the Captain & Tenille. The speakers were like hard plastic! My grandma had one of those big consoles. The sound seemed great, at least at that time. There's something very special about holding a record case in your hand and reading the lyrics and information about the artist. I miss that! Can you believe that before I left Florida to move back to Philadelphia in 2001, I made a very rash decision to toss out all my LP's (into a dumpster) because I didn't want to transport them during my move? When I think back, I could slap myself because I had two crates filled with some really great vintage records. "I have just been going through my CDs, playing all of them in case there are any I no longer want. I removed one so I still have around 50 to keep me going." I still have a lot of CD's as well which listen to. I have a portable CD player that I use when I sit in the park in afternoon, but I also have a full size CD in my apartment because I enjoy listening to music while doing housework.
" remember having two Xmas storybooks that you played a record with to read along. The narrator would say, "Turn the page . . ." I LOVED it." OMG...I had the SAME THING when I was a kid! 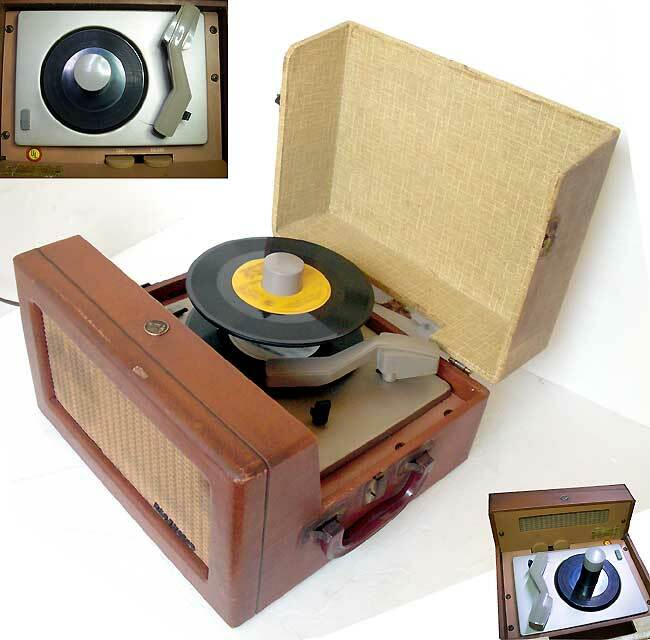 I a Show N' Tell record player like this one: https://i.ytimg.com/vi/S2oMT859wG8/hqdefault.jpg . I was the COOLEST thing because it felt like I had my own television set that played movies and music!
" I graduated to LP's like Shaun Cassidy and the Captain & Tenille. The speakers were like hard plastic!" HAHAHAHA! I had records by both Shaun Cassidy and the Captain & Tenille to! I love the song, "Love Will Keep Us Together!" "There's something very special about holding a record case in your hand and reading the lyrics and information about the artist. I miss that!" Yes! Yes! Yes! You are soooooooo right about that! It's kind of like the difference between reading a book on a Kindle versus holding a REAL book in your hand. Thanks so much for stopping by, my friend. Have grrrrrrrrrreat weekend! Records have made a serious comeback. I always thought my copy of Houses of the Holy would be worth a fortune if it hadn't been ruined after a basement flood, as it was my stepmother's and she bought it when it first came out. Then a few months ago when I finally bought one to replace it, the original printing from the 70's was half the price of the new ones in the record store. In perfect condition. Amazon sells some decent record players for like $30. "Records have made a serious comeback." That is so great to hear! Isn't it something how so many things from the past eventually come back? It's like fashion, if you wait long enough....it eventually recycles itself. "Then a few months ago when I finally bought one to replace it, the original printing from the 70's was half the price of the new ones in the record store. In perfect condition." WOW! For some reason I thought original records would be worth fortune. $30.00 for a record player on Amazon?!?! That's amazing! Thanks so much for stopping by, Mich! Hope your enjoying a great weekend! I'm glad seeing those 45s inspired a trip down Memory Lane for you, Ron! I have to laugh, though - I'm pretty sure you know Tara and I only buy music on vinyl. In fact, just last night I picked up a new record. I guess you could call us music snobs, but really, there's no better medium out there in terms of warmth and sound quality. You'll also be happy to know I still own a copy of Make It Bg that I bought as a teenager. It's in perfect condition, too! Hope you "jitterbug" your way to a happy Sunday! Ron, I *still* have some vinyl!! Back in the day, our high school band (and later, our band camp band) produced an LP, both of which I still have. How I wish I had something to play them on again, though! Once upon a time, I came this close to transferring them to cassette, but I never did. Now I'll just have to remember how we sounded and hope the years don't distort these records too much. You know, I suppose if you were the yard sale type, you could pick up some great bargains in vinyl or the players for them. People toss out that sort of thing when they move or die. What is it they say, One men's trash is another man's treasure. Great post, my friend. Enjoy your Sunday! 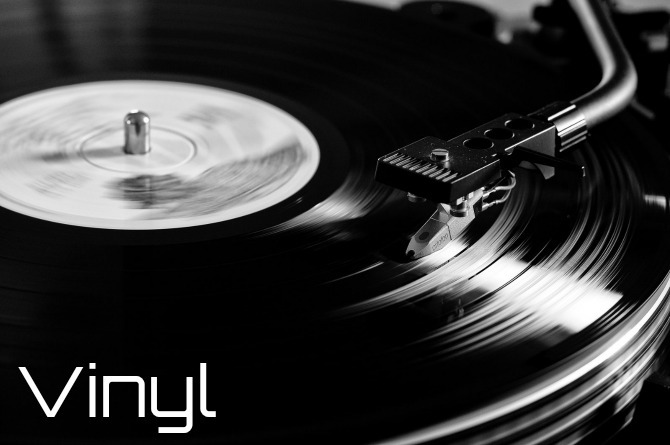 Mark, I so thought of YOU when I was putting this post together because I know how much you LOVE vinyl. 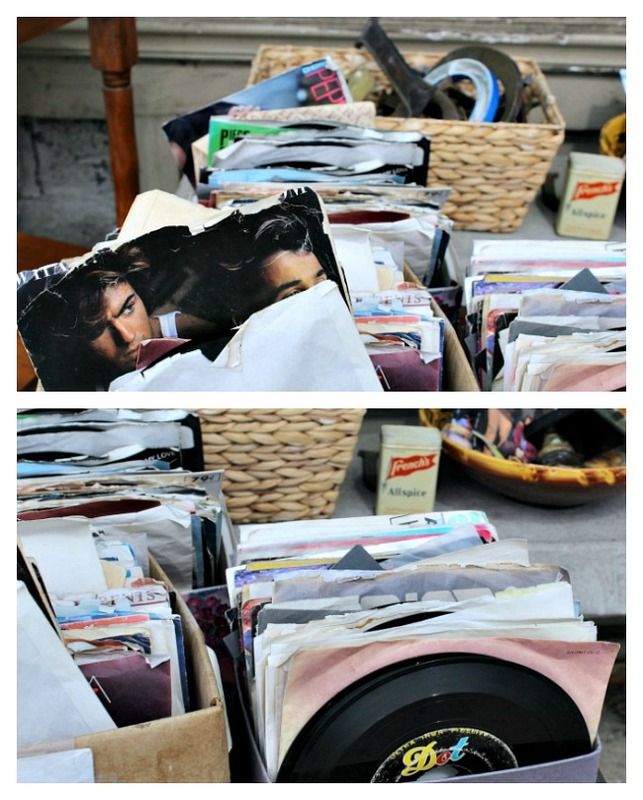 I also thought of you when I spotted those 45's while in Chestnut Hill in the Spring! "I guess you could call us music snobs, but really, there's no better medium out there in terms of warmth and sound quality." No, I don't think you're a music snob at all, I just think you know your music and how it sounds the best - on vinyl. It's kind of how I feel about drinking wine from a bottle with a cork, it tastes better to me. "You'll also be happy to know I still own a copy of Make It Big that I bought as a teenager. It's in perfect condition, too!" OH. MY. GOD....how faaaaaaaaaabuous is that! When I think of all the vinyl records I once had, yet threw away before I moved back East in 2001, I could slap myself silly! Thanks so much for stopping by and sharing your passion for vinyl, my friend! "I *still* have some vinyl!! Back in the day, our high school band (and later, our band camp band) produced an LP, both of which I still have." OMG, you're kidding me, Debbie?!?! That's AWESOME!!!!!!!!!!!!!!!!!!!!!!!!!! One of my other readers mentioned something in her comment about seeing record players on Amazon for only $30.00, so may want to check them out if you're interested in getting one. "Once upon a time, I came this close to transferring them to cassette, but I never did. Now I'll just have to remember how we sounded and hope the years don't distort these records too much." It's funny you mentioned about transferring them to cassette because I still have cassette tapes that I would love to transfer to CD's because tapes have a tendency to lose the quality of sound the older they get. I also have some VHS tapes that I would love to transfer to DVD's. Thanks so much for stopping by, my friend. Hope your weekend was faaaaaaaabulous! My first in-car stereo was a Muntz record player. My second was a 4-track tape player. The record player was actually a pain. For one, it was large, and attached to the underside of the dash, right in front of the passenger. It was a regular occurrence for the passenger to either kick, or knee the player hard enough to make it skip, or even scratch the record. The second problem was that the interiors of cars get hot. If you left your records in the car for any amount of time at all. They would melt! Not to liquid of course, but into shapes that would never sit flat on the turntable again. I think I destroyed almost every 45 I ever owned by leaving them in the car. Usually, just sitting on the back seat. I eventually took the record player out of the car, and installed it in my room. I plugged a cheap auto battery charger into the wall, and attached the battery terminal clips onto the wires coming out of the player. I bought four cheap auto speakers (the round ones), and mounted each of them in a shoe box. I didn't use it for very long, but it worked fine. I still have a few boxes full of vinyl albums. I really need to sell them (if possible). I'm not one of those who believe that a record creates the "only pure sound," so i'm not likely to be buying a turntable anytime soon. Thanks for trip down memory lane! Ron, you and I being practically the same age, this post brought back so many wonderful memories for me! Do you remember in the late 60's- 70's the teen-idol/singer Bobby Sherman? I had such a crush on him and had several his songs on 45's. My girlfriends and I would sit in my bedroom on the weekends and listen to his records all afternoon. He also starred in a television series called, Here Comes The Brides. The console stereo you pictured here is like the one we had in my family as well. And I also had one of those record boxes that stored my 45's. Love the song by Toto you shared, I remember it well! OMG Elaine....YES!!! !....I do remember Bobby Sherman! And I had to laugh because I TOO had a massive crush on him when I was teen - HA! I had his records too. Do you remember the song, "Julie...Do You Love Me" and "Easy Come, Easy Go"? I used to listen to them over and over again! Yes......I most certainly do remember the TV he was on because I watched it every single week! I used to think he was soooooooooo cute! "Love the song by Toto you shared, I remember it well!" Isn't it a GREAT song? And it brings back a lot of good-time memories for me when I was in my 20's and still living in Florida. Thanks so much for stopping by, neighbor! Hope you had a fantastic weekend! "I had that Carole King album! " OH. MY. GOD......(and this is probably another "Libra thing" but I TOO had that Carol King album, I kid you not! And it's funny because I was actually going to mention that in his post, but forgot. "I went and married someone who has a big vinyl collection. But lately we've been listening more to CDs and I secretly hope someday we'll clear out the vinyl. shhh.... he doesn't know that. ;-)"
HA! I also still listen to CD's. And it's hilarious because when I tell people I still have a CD play and listen to CD's, they look at me like I'm crazy. Have a great week, my friend And thanks so much for stopping by! "My first in-car stereo was a Muntz record player. My second was a 4-track tape player." OMG, I'll have to google that because I've never heard of an IN-CAR Muntz record player or a 4-track tape player??? I am TOTALLY blown away by the fact that they once made a record player for INSIDE your car. I had no idea that something like that ever existed?!?! And reading your comment about how the challenges it caused, it's no wonder you thought it a PAIN. Before I left Florida to move back to Philadelphia, I thew out TWO crates of LP's that I owned. I didn't feel like hauling them back East and then carrying them up to my new apartment. Plus, I thought they were a thing of the past. But apparently, vinyl is coming back. Thanks so much for sharing your wonderful comment about vinyl, Pat! Really enjoyed it! Oh my, you took me back to my childhood and early adulthood with this post! My first record was a 45; Crimson and Clover by Tommy James and the Shondells. My parents thought the record had a scratch on it!! :-) Fast forward 50 years or so....I'm sure I have a box of vinyl albums in storage somewhere. But, sadly, no turntable in which to play them. I remember my parents having a console turntable. What a time machine experience to walk into that store! Thanks for the trip down memory lane! We still have a vast collection of vinyl records - my husband is a hoarder! I had two FULL crates of LP's that I threw out before I moved back to the North East. There is a part of me that wished I had kept them. Oh well...that's water under the bridge.
" My first record was a 45; Crimson and Clover by Tommy James and the Shondells. My parents thought the record had a scratch on it!! :-) "
And you're not going to believe this but I had that same 45 as well, Lisa, I kid you not! I think it was originally my older brothers record which he handed down to me.
" I remember my parents having a console turntable. What a time machine experience to walk into that store!" HA! Time machine indeed! When I think back to when I was a kid, I never ever dreamed there would be just advanced technology as an CD' play, iPod, or Smart phones!!! What a great post, Ron! 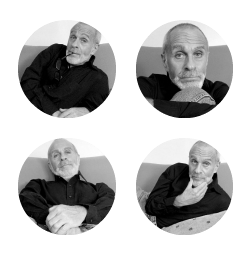 Love the pictures! My best friend is totally into vinyl and has quite a large collection. He and I will sometimes get together on a weekend night and drink a few beers while listening to LP's on his record player. He keeps his records in mint condition so the sound is incredible. There is something so cool about reconnecting to technology of the past. OMG...that's AWESOME! I haven't listened to LP's on a record player in YEARS! Right before I left Florida to move back East, I tossed (into the dumpster) two crates filled with all the LP's I collected over the year because I didn't feel like lugging them in the move. I could slap myself now for doing that. "There is something so cool about reconnecting to technology of the past." Thanks so much for stopping by, buddy. Hope you're having a FAB week! hey ron. isn't it something seeing vinyls. kids today are probably like WTH is that, a frisbee. i held on to my vinyls, but i can't find them. i think i left them in the attic of where i used to live. i can go back and get them because the owners are still there, but i haven't. i'm also missing some clothes. there were raccoons or squirrels in that attic. my niece has a record player she bought and i gifted her two vinyl albums from amazon a few months ago. africa!!!! what a throwback. thanks for the walk. "kids today are probably like WTH is that, a frisbee. " HAHAHAHAHAHA! OMG Val, that is HILARIOUS! And you're probably right! I used to have two crates filled with LP's, but tossed them out before I moved from Florida to Philly. I could slap myself silly for doing that because I had SO MANY GREAT albums that you can't get on CD's any longer - they are no longer in circulation. "my niece has a record player she bought and i gifted her two vinyl albums from amazon a few months ago." That's awesome! I heard from one of my readers that you can get them very reasonable on Amazon! Don't you love the sound of Toto? Africa is my favorite! Thanks so much for stopping by, girl. Have a faaaaaaaaaabulous week! I forgot to ask you something. Do remember, or did you ever have a "quad" system? It did double of what stereo did. Different tracks could play out of four speakers. They came out in the early 70's by Sansui. I paid a small fortune for mine, and although it sounded pretty good, they constantly had technical problems (like frying amps). Because of those problems, very few albums were released. OMG....yes, Pat!!! I totally forgot about the quad system (quadraphonic). I never had one myself, but I recall a friend in Florida who did. I remember it being BIG. Seeming like something you'd see in a professional recording studio.